My dad, born in the mid-50’s, has a modest vinyl collection: just a few boxes, but more than one person could lift all at once. One of his most worn records is the soundtrack to 1983’s The Big Chill. While the film earned mixed reviews, the tracklist in the credits reads like a greatest hits compilation from my parents’ college years. The leading edge of my generation, or at least the indie kids, might have parallel feelings for Garden State‘s soundtrack. And now Guardians of the Galaxy features a roster of songs that is making waves with—well, my dad and other baby boomers. For all the movies known for their music, though, have you ever wished for the soundtrack to your favorite book? The idea isn’t so strange. Of course, it might not do to follow the route above, featuring well-known radio songs. A good book deserves more of an “Original Music from the Major Motion Picture” approach, with new compositions tailored to the story. Caitlin Pequignot (sole member of Anchorage) and I actually discussed this sort of thing on a recent podcast. She recounted ambitious storytelling concept albums from Arcade Fire and Radical Face and I pointed to a couple of printed works produced in tandem with records, The Armory Wars and Ribbon. Now, she’s making it happen herself. Prodigal, released just before 2014 expires, is a suite of acoustic-electronic pop tracks with moods and lyrics inspired by a forthcoming novel of the same name, penned by Pequignot. When we spoke, she hinted that some songs were born from her experiences going through a major life transition—graduating college—while others referenced plot elements, conversations between characters, and plot elements from Prodigal, the book. This demonstrates another powerful technique that I can’t recall seeing before. Chart-topping artists will release singles to the radio in advance of their albums to generate excitement, but you never see movie soundtracks at the record store until the flick is in theaters. Whether by choice or necessity, Pequignot has chosen to make the Prodigal album available prior to its namesake novel. Keen listeners can get a taste of the fantasy flavor and maybe attempt wild speculation about possible story elements. Still, what we have so far is music; I’ll focus on Prodigal qua music. In 11 tracks and 40 minutes, Anchorage inducts the listener into a new space, allows her to explore its depth, and guides her, ascending, to the exit. I would not recommend cherry-picking songs on shuffle, because the album is ordered intentionally and the effect of a complete listen is enchanting in the end. To be honest, graded independently, the opening track doesn’t rank among the strongest offerings. But I encourage you to start there and proceed from the start toward the finish in order to experience the payoff. “New York, 2010” sets the stage lyrically and tonally. Prodigal has a dark feel to it: not an oppressive, evil darkness, but that of a night that falls heavy on the world. Synthesized drums beat a ponderous pace in many of the tracks and dense arrangements lend an aspect of body to the songs, the way that a wine can be full bodied. The effect, which escalates throughout “New York, 2010,” is that one can become swathed in the music. If you enter with open ears, you’ll be lead to this point over the first five minutes, then held there for the remainder. After a couple of listens, I judge the midsection, from “Love You Now” to “Dazed,” to be where the album hits its stride. Compositions are engaging with vocals and instruments clicking perfectly. Unfamiliar sounds will sometimes encroach to add intrigue and maybe even some edges, lest you get too comfortable. Yet transitions between emotions are always graceful, never abrupt. And with these tracks, as with the whole album, faster sections are separated by calm and restful passages but not by lulls in quality. Anchorage spends most of the album exploring stressful and uncertain circumstances. “When You Were Mine” and “Notre Dame” provide the only true respites, where uplifting melodies bring solace to the listener and prevent her heart from being overwhelmed. “Prodigal,” following “Notre Dame,” then ends the album on a wistful retrospection. (This is especially open to our imaginations as, without the book, we don’t yet know the events the lyrics are contemplating.) In the story arc of Prodigal, it feels satisfying to end with a song about an ending. And I’d praise this release if that were truly all; but in fact, there’s a bonus (twelfth) track tacked on the end. While “Letters from Eve” is clearly from outside the world of Prodigal, it manages to enhance the album significantly by welcoming us back to the real world, like the rising sun waking us from a dream. Musically, it is an all-acoustic piece with smiling strings and a message of hope disguised within a plea for help. Compared to 2012’s Out of the Garden (whose title may indicate a tie in with Prodigal‘s bonus track), Prodigal presents a sound that has matured and jelled in a brilliantly crafted package. It is the holistic quality of the album as a story, a world, a musical environment, that most impresses me in Anchorage’s growth. The sound palette of violins, vocals, and electronics inherits from Pequignot’s previous releases and is unique enough to be identifiable as her signature. Control over the timbres in her one-woman ensemble allow Pequignot to create an immersive experience here without any holes, and at the same time to take risks along the way. I would understand some listeners being deterred by the laser-like sounds and fierce electric violin solo in “Airplanes,” but those elements left my mouth agape with excitement. “Airplanes” is in contention with the title track to be my favorite piece overall. Without telling the entire story of the novel, Prodigal gives you the experience of reading a work of fantasy, chapter by chapter, in 40 minutes. Check it out if you like discovery and violins, or if you just enjoy the thought of a soundtrack to a book. 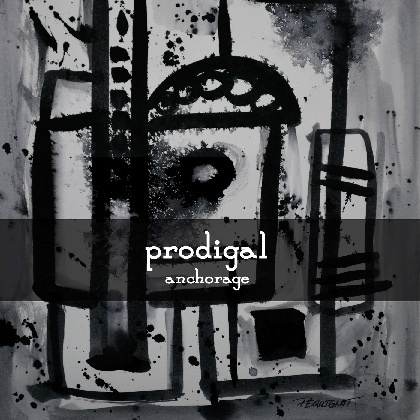 You can download Prodigal for free (or pay-what-you-will) at Anchorage’s Bandcamp, along with the artist’s earlier work. More info and links can be found at Pequignot’s website.